This is an actual wedding album page from one of our recent events. 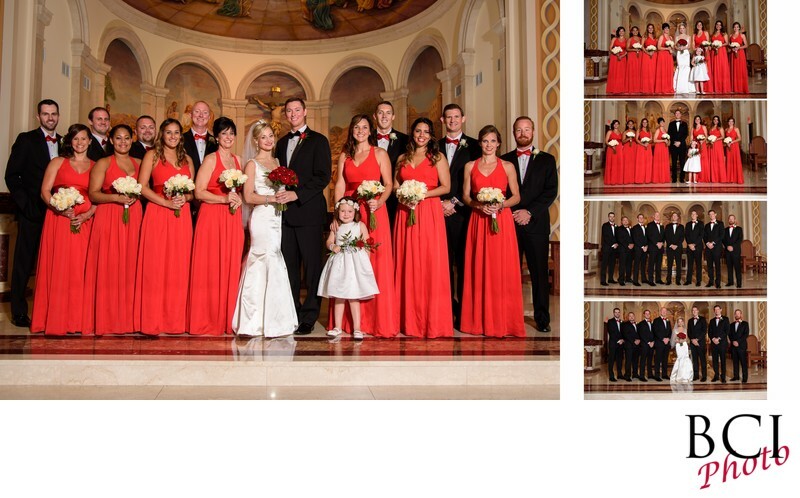 Shown here is the page dedicated to their bridal party formal images shot in the catholic church in orlando florida where the ceremony took place. Of special note here is the way we have chosen to light the bridal party, resulting in nice even lighting to compliment the entire group. We use the latest in professional off camera lighting to accomplish this whether your ceremony takes place indoors or out, and is a hallmark staple of our wedding day coverage here at brads creative images photography. A common question is: How long does it take to shoot the formals. Typically, this part of the coverage takes us 15-20 minutes. By doing them essentially the same way, and following our custom formula, we are able to provide a wide and consistent variety of images featuring all your bridal party and family members in an efficient manner so you can get on to the wedding reception with as little delay as possible. This way, "the formal wedding pictures" are no longer an ordeal to be endured, but they move quickly and efficiently, and we keep it light and fun too! The best way you can "help us" here, is to simply ensure all the needed family members STAY in the church (ceremony area). For it's only when we don't have the players......that it runs longer than 15 minutes. The easiest way to accomplish that, is to make that known during your rehearsal dinner, as pretty much all the key family and such will be in attendance.